Pride is defined in both a positive and a negative manner. To some, pride is something to avoid: “An irrationally corrupt sense of ones personal value, status or accomplishments.” – Wikipedia – Or as some would label it: “ego”. On the other hand, pride can be viewed in a positive sense: “A humble and content sense of attachment towards one’s own or another’s choices and actions…a fulfilled feeling of belonging.” – Wikipedia- In this case pride is viewed as a virtue. Two different interpretations of pride – two different outlooks on how a person carries himself or herself. In the kitchen, as in other places where careers are made, both defined individuals exist. My friend and a chef who, I deeply admire – Jamie Keating, owns and operates a highly successful restaurant in Columbus, Georgia called “Epic”. On the wall above his line rests a simple statement: Culinary Pride. This – to him and his crew represents all that the restaurant is about, all that the chef is about, all that the guests of Epic expect, and all that Chef Keating expects from his staff: a fulfilled feeling of belonging and a humble commitment to making the right choices with the food that they are privileged to work with. To a true professional – this is what it’s all about. I just began watching season three of “Chef’s Table” – an extraordinary series of documentary films produced by Netflix that depict the life of prominent chefs from around the world. The series is robust and deep in its ability to delve into the person behind the food, not just the result of what takes place in the kitchen. “What makes this chef tick?” I am pacing myself this time rather than binge watching through the entire series in a day or two, because I want to take time to have each chef’s video bio sink in. The first in the series takes a look at Chef Alain Passard who’s restaurant” L’Arpege in Paris is respected world-wide as one of the best. It’s long history of three-star Michelin rating points to the intensity and the quality of the restaurant and it’s food. What the series does best is to examine the mind, body, and soul of Passard. Once you have a sense of the individual then the reputation of the restaurant makes sense – the “why” becomes clear. Passard made a bold move a few years back and took all of the protein focused items off of his menu, all of the items that had brought him world acclaim and Michelin praise, and made the decision to become a vegetarian restaurant. This, in Paris of all places, was considered not just risky, but even suicidal. His reason – he had lost his passion for what he was doing and needed to find that excitement that brought him acclaim many years ago. He wanted to talk to his guests with a new voice and to energize his staff with a new, adventurous mission, and he wanted to pay respect to ingredients that had, for years, played a supporting role – never the lead. Passard did not use the term pride, but instead talked about “Grace” as a way to show respect for a new way, a way of excellence, a way to respect the ingredients and the process of cooking. How many of us who have made an active decision to spend our days in the kitchen can reflect on his words? The feeling, as he points to, of “belonging in the kitchen” is something that many cooks have made reference to: “This is a place where, no matter what, I feel like I belong.” We take pride in knowing that this is it – our calling, and in a humble way we feel very good about this discovery. When Passard and his team at L’Arpege are in the zone, author Christophe Blain who wrote a tongue and cheek book about Passard (In the Kitchen with Alain Passard), refers to the environment as “The Flow”. As he describes it, when the operation, built on Pride is in “The Flow”, nothing else can exist in the mind and hearts of the team. There is no room for anything else but total dedication to the process of cooking. In Yountville, California – a quaint little village on the edge of Napa Valley sits a restaurant that many consider the finest in America and one of the best in the world. The restaurants chef is noted with acclaim from all corners of the culinary world for his attention to detail, focus on excellence, and daring approach towards cooking. The restaurant is the French Laundry, and the chef – Thomas Keller. On the wall in his immaculate kitchen that some have referred to as a “Culinary temple” rests a single word: “finesse”. Finesse to Keller, his staff, vendors, peers, and guests have the same meaning as Chef Keating’s “Culinary Pride”. 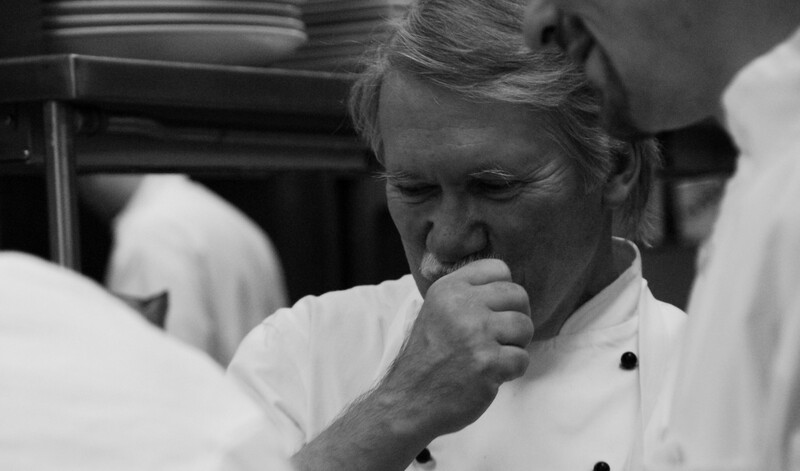 It is the humble mantra that says we have a mission, we owe respect to each other, the kitchen where we work, the ingredients we work with, and the history of the profession to do things right and to strive for perfection. This is not ego, it is the over-riding directive that demonstrates to everyone else – we are serious about what we do. There are many, many others who continue, in their own way to show this pride. The mission can be, applied to any type of restaurant. This cook’s pride is not exclusive to those extraordinary fine-dining restaurants that only a select few can afford to patronize. “The Flow” exists in most successful restaurants especially at the time of service. There is a need for total focus and commitment to cooking well, being consistent, respecting a cook’s role in the process of making great food, and knowing that their reward is a satisfied guest. We may use different terms, but the feeling and the commitment is the same. The beauty of becoming a cook is that we can most often choose how we approach the position. There are some, like Keller, Passard, or Keating who can’t choose because they are wired to take pride and their body and mind cannot accept the alternative, but most of us can make an active choice to be excellent, take pride, and show grace, or not. When a cook makes the choice to be all that he or she can be, and be the cook that the best would consider “the only way”, then the job changes. We are now part of something important, something pure and fulfilling. To be this type of cook is to be something truly special. Some others whom I have known and in some cases worked with: Anton Flory, Noble Masi, Daniel Boulud, Gavin Kaysen, Dale Miller, Tim Hardiman, Eamon Lee, Tim McQuinn, Curtiss Hemm, Jennifer Bennett, Kevin O’Donnell, Fritz Sonnenschmidt, Anne Rosenzweig, Eric Ripert, Michael Beriau, Walter Zuromski, Dan Hugelier, David Meyers, George Higgins, Charles Carroll, Lars Johanson, Roland Czekelius, Neil Connolly, Heather Miller, Steve Jilleba, Ed Leonard, Phil Learned, Marc Meneau, and countless other committed cooks and chefs. **Have you ordered your copy of “The Event That Changed Everything“? Tales of the kitchen, restaurant ownership, the integrity of the food supply, the environment, and restaurant relationships. ← THE FOUR TYPES OF COOKS – WHERE DO YOU FIT?